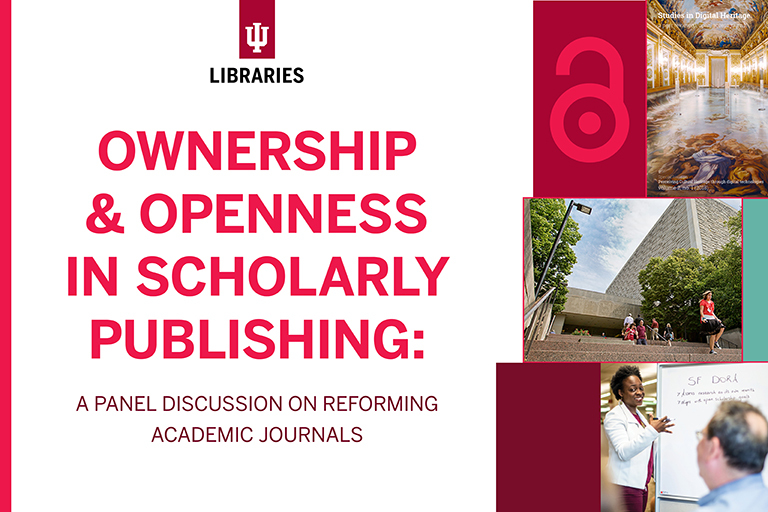 On February 20, 2019, the IU Libraries Scholarly Communications department hosted a panel, “Ownership & Openness in Scholarly Publishing: A Panel Discussion on Reforming Academic Journals,” that brought together IU faculty, staff, graduate students, and other professionals from various aspects of scholarly studies and publishing. The panelists included Cassidy Sugimoto, Gabriele Guidi, Vincent Larivière, and Bernie Frischer. The panel’s goal was to discuss the process of “flipping” journals–the process of converting subscription-based journals to open access journals, the experiences of two different journals in their transition to open access, and the implications of the open access movement on research. Cassidy Sugimoto is an IU School of Informatics, Computing, and Engineering (SICE) professor, and is one of the former editors of the Elsevier-owned Journal of Informetrics. She is one of the individuals who played an instrumental role in flipping the journal that is now known as Quantitative Science Studies. She is also the president of the International Society for Scientometrics and Informetrics (ISSI). Vincent Larivière is an associate ILS professor at the School of Library Science at the University of Montreal. He was also on the editorial board of the Journal of Informetrics and played a significant role in making QSS open access. The Journal of Informetrics saw its entire editorial board resign earlier this year– after an extensive but unproductive process to resolve their differences with Elsevier– in order to create a new journal that is more in line with open access principles and practices. The new journal, Quantitative Science Studies, has been accepted and is supported by The International Society for Scientometrics and Informetrics. Sugimoto, Larivière, and their colleagues hope that moves such as theirs, which are happening increasingly as journals work toward being open access, will spur other journal editors and staff to work to make their own journals part of this movement. As of January 2019, QSS is accepting submissions. Gabriele Guidi, an engineering professor from the Politecnico di Milano, and Bernie Frischer, an IU SICE informatics professor, are co-founders of the open-access journal Studies in Digital Heritage (SDH), previously known as the Digital Applications in Archaeology & Cultural Heritage under Elsevier. After attempting to collaborate with Elsevier to remedy concerns about their high APC for open access, their unwillingness to help the journal embed 3D models for illustration and interactivity, and their discontent with the slow growth of the journal, Guidi and Frischer chose to cut ties. In October of 2016, they parted ways with Elsevier and have since been taking the necessary steps to make their journal open access. Since publishing with IU Libraries, Studies in Digital Heritage has published 50 articles in 2 years, culminating in 2 issues per year. The journal has been able to not charge an APC or a subscription fee to any of its users. Guidi also cited open access efforts as helping to combat issues of oligopoly and indexing in scientific publishing. Reed-Elsevier, Springer, Wiley-Blackwell, Taylor and Francis, and SAGE currently dominate the publishing market. This leads to exorbitant costs, anywhere from $2,000-$4,000 (or more) for authors to publish in a high-impact journal. In contrast, collaborating with a university library to publish an open access journal can provide a more sustainable model. For example the institution invests so that authors pay a smaller fee, which can be as low as $250. Lower costs and increased freedom in publishing practices are among the factors that are drawing editors to the open access movement. This panel brought together scholars from a variety of disciplines and approaches to advancing access and research. The question and answer period was lively, with audience members asking questions ranging from how open access journals will impact student research to what the success of open access journals and their funding looks like long-term. The panelists’ responses to trends in open access and scholarly publishing illustrated that the push toward open access is crucial for the success and sustainability of academic publications, as well as determining what resources remain available to future scholars. Although there are obvious hurdles in the process of making a journal open access, based on the discussions that took place over the course of this panel it would seem that a growing number of editors are willing to make the change in order to attempt to disrupt the often frustrating current trends in academic publishing. JAA’s inaugural issue focuses on sustainability and innovation in academic advising, a theme that is highlighted in Cheryl Wanko’s “Advising for Sustainability: A Challenge.” Wanko, an English professor and the chair of the Committee for Advising Excellence at West Chester University, asks how universities and advising can “cultivate more sustainable behaviors and life perspectives to help alter our culture’s self-destructive course” (p. 7), and how daily advising practices can promote awareness of environmental sustainability efforts. Kay S. Hamada, Assistant Specialist and Academic Advisor at the University of Hawai’i Mānoa, also contributed to JAA’s first issue with an article entitled “A Conceptual Framework for Disruptive Innovation in Advising.” Hamada discusses the various ways in which advancements in technology and other services necessitate changing how advising practices are approached. She terms this innovation as being “disruptive” because it often alters the theories and frameworks that have helped create existing practices. 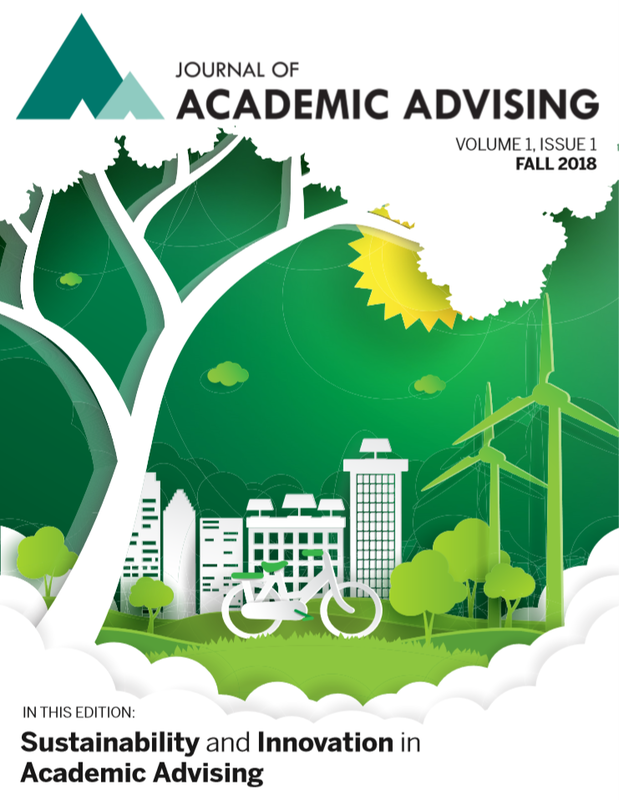 The Journal of Academic Advising asks important questions about the impact that advisers and advising can have, outside of their traditional roles. JAA is completely open access, providing an audience for the content that may extend beyond the field of advising. The Scholarly Communication Department looks forward to the ideas and perspectives that this journal will bring to the table in further issues.